Retail $169.99 SAVE 20% ! "Great intro to wooden boats"
As someone else has mentioned, this is a Plank on Bulkhead type build. I&apos;ve been working on it on-and-off for two years and really like it. The instructions do not walk you through every detail, and you would be wise to look for help on forums if it is your first wooden boat build (as was the case for me). The mahogany planks for the hull are decent, but they give you extras for a reason. I soaked mine in warm water for 15 minutes before warping them to the bulkheads. Use the extras to play around with what works for you before venturing too far. And absolutely only do one plank at a time. The gunwales were also very difficult to fit, and I also recommend soaking them, although not for as long (they are a softer wood). Deck furniture and accessories seem to be generic -- the deadeyes, guns, carriages, etc. are not quite to scale -- but it&apos;s not bad enough to complain about. I would highly recommend looking online for other options for line for the rigging. That was the weakest part of this kit by far. The sail cloth also was not satisfying and I went to the fabric store and got something with more weight. All and all, very fun! Expect to spend a lot of time on this. It is not a quick build by any means. The Atlantis Initio series is designed for the intermediate builder, and the hull needs to be assembled. This ship is a magnificent scale reproduction of The Albatros sailing ship, which was built in 1899, also known as a North Sea Klipper.It went through a complete restoration in the mid '80s and was recommissioned as a sailing cargo cessel with classification GL 100 A4K, and still sails today! Various types of top-quality woods are used. Complete with quality brass and metal hardware and fittings needed for completion. Wooden deadeyes, channels, grating strips, pin racks and more! Yarn for an authentic rigging appearance. Cotton sails. Large, easy-to-follow plans and simplified pictorial instruction that illustrate every phase of construction (instruction booklet is in 7 different languages). Very nice kit to build. Wood is nice quality and kit goes together well. Is a bit challenging for true novice but is a great example of plank on bulkheads. Great practice for more complicated construction and requires some effort to get a very nice final product. But worth the effort!!! It is a good build and very fun to put together. easy to read manual and it come with a free set of tools. I would recommend this to new builders to do a plank on plank hull. A comment. 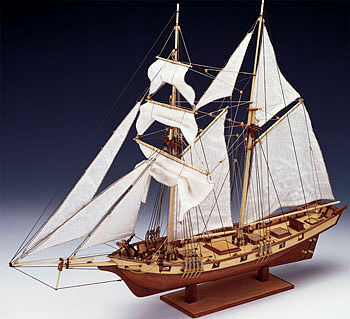 You have this model listed as &apos;plank-on-frame&apos;, as you do most of your ship models. Should be &apos;PoB&apos; (plank-on-bulkhead). Big difference for serious modelers.